몇인치 모니터야 정상으로 페이지 내용을 보일수 있으가…. 더많은 스크린샷은 아래 링크를 참조하세요. Posted on 2006-12-07 Categories 잡동사니Tags Firefox, 파이어폭스Leave a comment on Firefox에 200개 Addons를…. Does the sudden appearance of a Firefox crop circle imply which browser extraterrestrials prefer? We don’t know, but it was still fun to make! 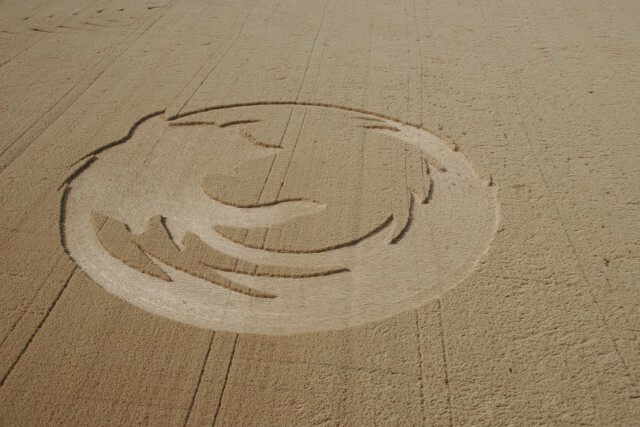 Constructed by local Firefox fans and the same team that created the Firefox mural from cornstarch and kool-aid and launched the Firefox weather balloon, the Firefox Crop Circle project shows that we have so much passion for Firefox that we want it to be visible from space! Planned in under two weeks and completed in under 24 hours, the crop circle had a final diameter of 220 feet. We constructed the circle in an oat field near Amity, Oregon, where it was completely invisible from the road but unmistakable from the sky. Our team consisted of 12 people, mainly OSU students, and we carefully stomped down oats from 3:30pm Friday afternoon until 2:30am, putting on the finishing touches between 7:30am and 11:00am Saturday, August 12. Matt and John, Mozilla video interns, came up with the idea a few weeks beforehand. Fueled by the enthusiasm of Asa Dotzler at Mozilla, suddenly the crop circle was within reach. While at OSCON 2006 in Portland, the three of them ran into members of the OSLUG, and things really started to take shape. With the idea, the enthusiasm, and the commitment in place, the next thing we needed was to find a field and contact the owner for permission. At first, we simply asked people visiting the Mozilla booth if they had a field or knew anyone in the area who did. Even at OSCON, where you wouldn’t expect to find too many farmers, we had a few leads right away, which showed how close we were to making the project work. Finally, Beth contacted Alex, whose family lived near the owners of an oat field in the Amity area. A few phone calls and emails later and permission was secured! We had an unharvested field of oats! Other important details were worked out soon afterwards: We coordinated our schedules and settled on a weekend. We worked out car-pool plans and made a list of supplies. We even found a pilot to help us see what we were doing from the air! Finally, we were ready to begin planning the crop-circle’s construction. We quickly designed and printed large posters that had a two color version of the logo. With that we bisected the image into 32 sections and overlayed 60 concentric circles with even space between them. In our mock up, the gap between the circles was two feet. On top of the design, we also constructed our stompers. Inspired by the discovery channel, our stompers were constructed using 2×4’s and rope. With our plan and stompers ready, we hit the field. First, the Firefox globe was created by connecting a taut measuring tape to the end of a stake and walking around in a 220ft circle. “*walkie talkie screech* we’re going from 2 to 4 from 74 to 86 *screech*“. This was standard lingo we developed to quickly report our progress to the rest of the team. For example “from 2 to 4 from 74 to 86” means we were about to stomp an area from ray number 2 to ray number 4 (somewhat analogous to going from 2 o’clock to 4 o’clock) with a depth from 74′ from the center to 86′ from the center. With two teams of stompers, each with a walkie talkie and smaller version of the map, we reported our progress to our map team located outside the circle where they recorded all the work by highlighting it on their copy of the map. The map team then knew what needed work and what had been finished even when the stomping teams couldn’t see each other. After we stomped down all the big areas in a boxy grid-like pattern, we “connected the dots” by smoothing out all the edges and blending the corners of the grid to fill everything in. For the most part, everything went perfectly! 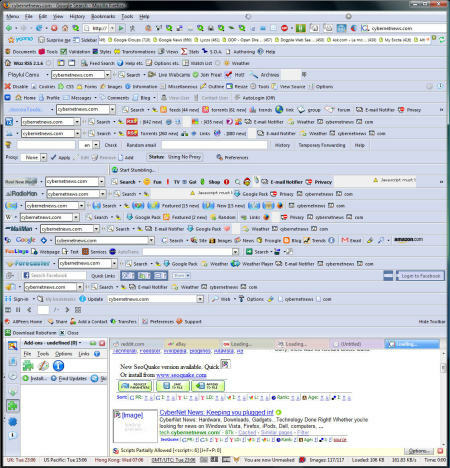 We had a brief accident around midnight and accidentally gave our Firefox a little bump on the head, but after we saw what we had done, fixing it wasn’t very difficult. We bet you can’t even notice! Like any good open source project, we spent a lot of time documenting the process. We had an army of digital cameras, two dedicated videographers, a plane, and a helicopter. All of this allowed us to get some great coverage! The hard work paid off! Maybe the google earth cameras picked it up!